Optical illusions like the one at the top of the page may not actually be bright, but our brains — and now it seems our eyes — think they are. 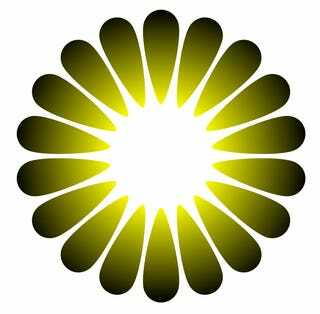 This radial sunburst illusion is known as the Asahi figure, and the researchers analyzed people's eyes while they stared at it, and a number of other similar optical illusions. And just as if they were staring at an actual light source, their pupils contracted. By scrambling and tweaking the illusions, the researchers found that the amount the eye reacted was directly tied to how bright the viewer thought it was — a factor completely separate from its true luminosity. They also ruled out contrast changes and wandering pupils as factors. So what's the takeaway from this? The physiological response of our eyes is at least partially based on subjective perception, not just a physical absolute. So how we perceive an illusion changes how our body reacts to it, even when it comes to automatic responses like pupil dilation.